At 11.40pm a large mass loomed into view and lookout Frederick Fleet immediately alerted the bridge – ‘Iceberg right ahead.’ First Officer Murdoch ordered evasive action, but the ship scraped along the side of the iceberg which ripped intermittent holes along the starboard side below the water line for about 300 feet. Murdoch closed the watertight doors which ran the length of lower decks but the icy water poured in, flooding the first five watertight compartments. The devastating extent of the damage soon became apparent to Thomas Andrews who informed Captain Smith. The crew were mustered to begin loading the boats whilst the ship’s position was given to Phillips and Bride in the Marconi wireless room, with instructions to call for assistance immediately. 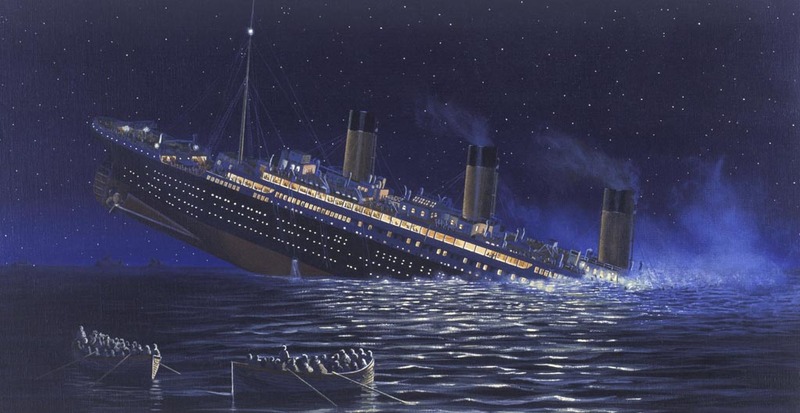 Questions remain over the accuracy of Titanic’s given position ( 41’46’N 50’14’W) and the location of other ships in the area that night who may, or may not have been able to render assistance. At 12.25pm Carpathia’s only wireless operator Harold Cottam received Titanic’s distress signal as he was preparing to retire to bed. 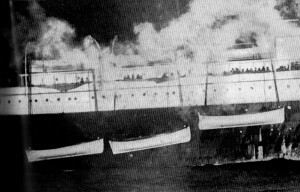 Immediately, Carpathia’s Captain Rostron set course for the stricken liner at full speed and made detailed preparations to receive survivors. At 58 miles away though, she would not arrive until around 4am. 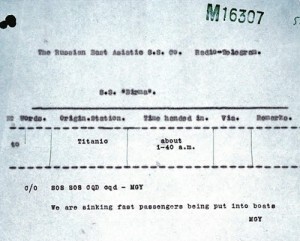 Titanic took two hours and forty minutes to sink giving time to load most of the lifeboats. Although she infamously had too few boats to accommodate all on board, she had four more than the Board of Trade regulations demanded. Of these four collapsible boats two (A and B) floated off as she sank, collapsible B upside down but still acted as a raft and A, with no time assemble the sides, was badly flooded.The first boats left with many empty places before the true nature of the situation was grasped by passengers, and by the time many Third Class passengers managed to reach the boat deck, most of the lifeboats had gone. Lowered at 12.55am lifeboat no. 6 (above) contained around 24 people although it had a capacity of 65. Amateur yachstman Major Peuchen was ordered to climb down the ropes into the boat after an appeal by Second Officer Lightoller for more seamen to help man it. Boat no. 14 (pictured left with mast) lowered away around 1.30am with up to 45 occupants. As the danger became more apparent disturbances surrounded some of the boats being loaded, and Fifth Officer Harold Lowe fired warning pistol shots alongside the liner to stop boat 14 being being swamped by a crowd. 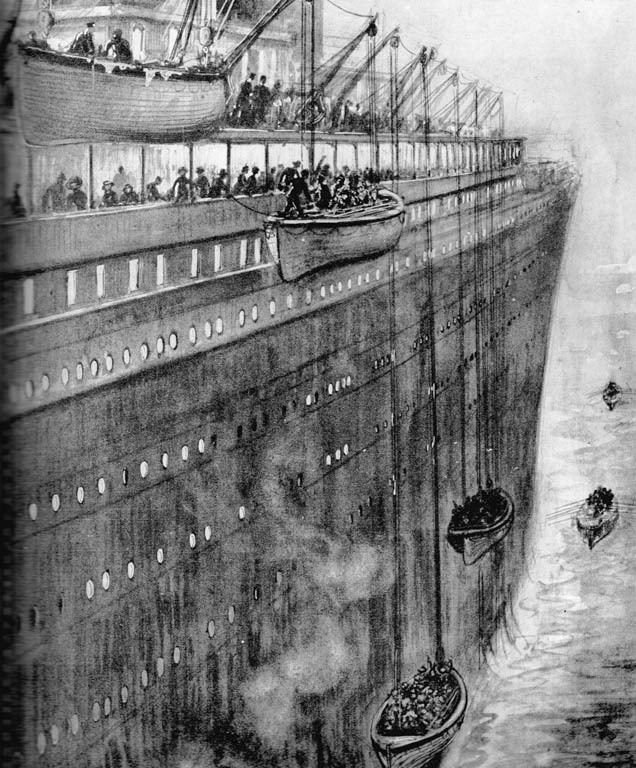 Titanic’s lights kept burning until moments before she foundered thanks to the sacrifice of engineers below with no chance of escape. 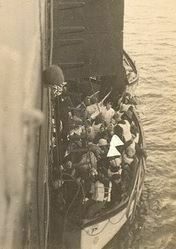 She sank beneath the waves at 2.20 am plunging over one and a half thousand people into the freezing North Atlantic. 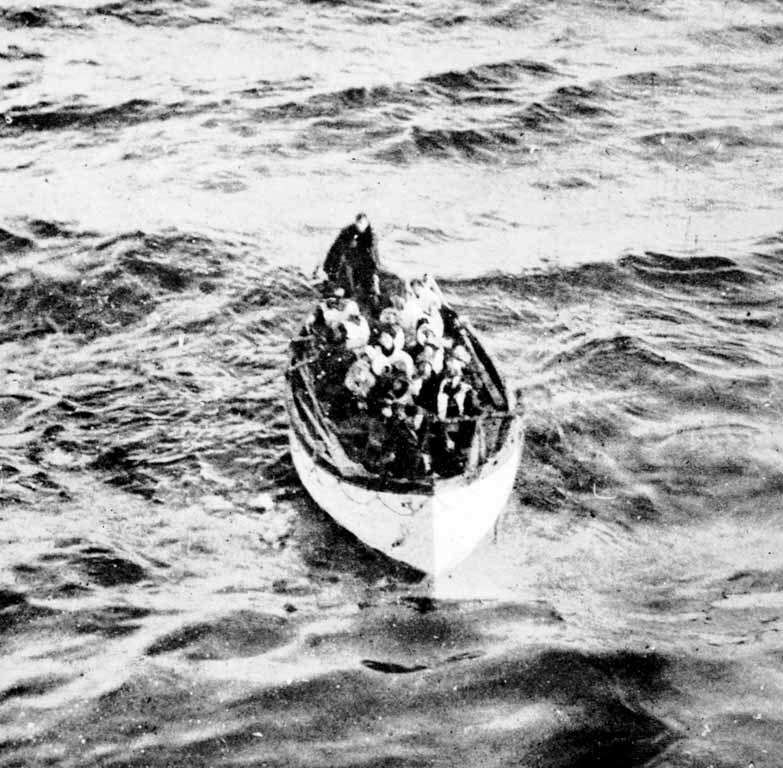 Desperate swimmers clung to wreckage and the two collapsible boats A and B, but survival was almost impossible. Fifth Officer Lowe gathered lifeboats together, transferred passengers to free up a boat, and went back to the wreck site for survivors. By the time he arrived only three were rescued alive from the icy water. 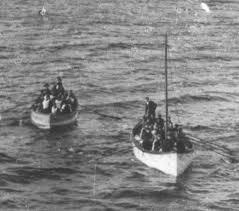 When Carpathia arrived at the scene still looking for a crippled Titanic, lifeboat no. 2 was spotted and the first of the survivors boarded the ship at 4.10am, and conveyed the terrible news to their stunned rescuers.